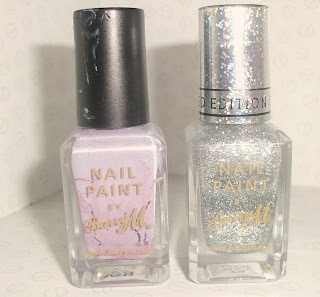 It's that time again, a nail post! I wanted to do something really pretty than would help my tan -fake tan to be correct- to stand out, so of course it had to be a light colour so I went for this really pretty lilac. But to make it more fun I added one of my favourite trends, a bit of gradient. Sorry about the quality of the pictures, my camera did not like the glitter and the light colour -to be fair I don't think I had it on the right setting actually-. But as you can see the lilac colour is the base and then I used a sponge to create a gradient with the silver glitter. I just think it is so pretty and I've had so many compliments on them, so you should definitely try out a gradient if you haven't already! It's so simple to do, just use a triangle make-up sponge to apply a lot of varnish to the top and work you're way down when the varnish is thinning out to create a faded effect. 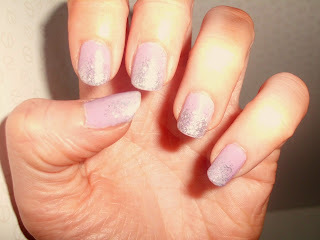 To create this look I used two BarryM polish's, they have a great range of glitter polishes! 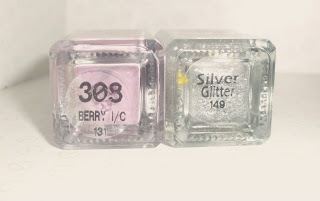 The lilac colour is in the shade Berry Ice Cream, which I have to repurchase as you can probably tell from the state of the bottle and the clear crack in the varnish you can see through the glass. The glitter is simply in the shade Silver Glitter, and it just goes so nicely with like every colour, it's also really build-able to be used on it's own or put on a thinner layer to use as a topcoat. Hope you enjoy the look of these nails, think I may try it out with some different colours next so stay tuned for some pictures of that!